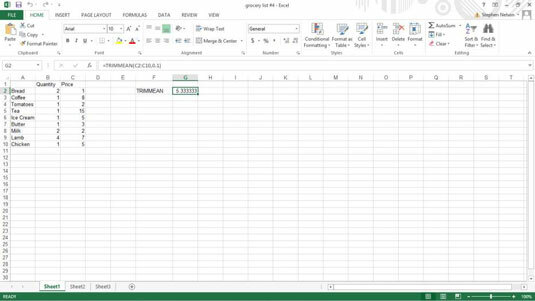 Excel provides you with a handful of statistical functions for calculating means, modes, and medians. Take a look at the following descriptions for examples of how to use these statistical functions. where number1, [number2] is a worksheet reference to the range that stores the values. As is the case with many other simple statistical functions, you can include several arguments as part of the range argument in the AVEDEV function. For example, the formulas =AVEDEV(B1,B2:B5,B6:B7,B8,B9) and =AVEDEV(B1:B9) are equivalent. Note: The AVEDEV function calculates the average of the absolute value of the deviation. For this reason, the function calculates absolute differences, or deviations, from the mean. The AVEDEV function isn’t used in practice. Mostly a teaching tool, educators and trainers sometimes use the average deviation measure of dispersion to introduce the more useful but also more complicated measures of dispersion: the standard deviation and variance. If your argument includes the three values — , 100,200 , and 300 — the function returns the value 200 because (100+200+300)/3 equals 200.
where number1, [number2] is a worksheet reference to the range that stores the values — and possibly text as well as logical values. If your argument includes three values — 100, 200 , and 300 — and three text labels in the worksheet range that you supply to the AVERAGEA function, the function returns the value 100 because (100+200+300+0+0+0)/6 equals 100. As is the case with the AVERAGE function, you can supply up to 255 arguments to the AVERAGEA function. Note: You can supply up to 255 arguments to the MEDIAN function. If you use the MEDIAN function to find the median of a range holding the values 1, 2, 3, and 4, the function returns the value 2.5 . Why? Because if you have an even number of data entries, Excel calculates a median by averaging the two middle values. Note: You can supply up to 255 arguments to the MODE function. where number1 and, optionally, other similar arguments supply the values that you want to geometrically average. where number1 and, optionally, other similar arguments supply the values that you want to harmonically average.